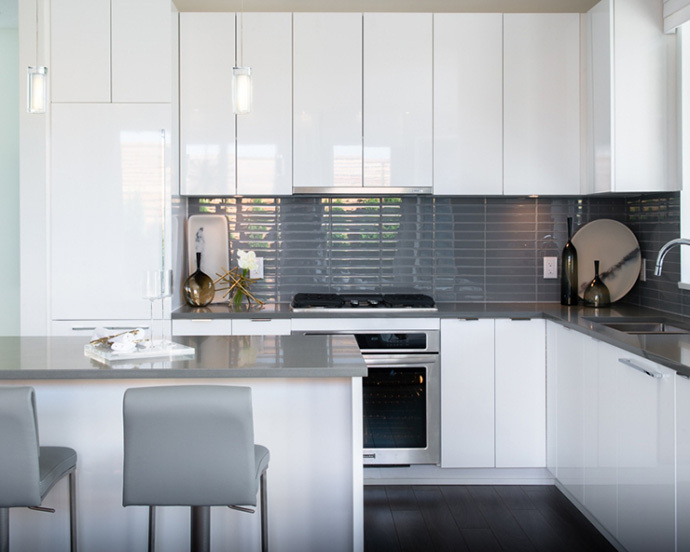 The Vancouver Condo Buzz » Phase II at Alexandra Court Richmond Belgravia Condos Now Previewing! 1 to 3 Bedroom Floor Plans Available! « New Vancouver Citti Broadway-City Hall Condos located in the West Side Vancouver Broadway Corridor Now Previewing! Phase II at Alexandra Court Richmond Belgravia Condos Now Previewing! 1 to 3 Bedroom Floor Plans Available! Missed out on the first phase release at the master planned Richmond Alexandra Court Polygon development? Here’s your new chance at owning in this award winning community built by a top end developer noted for their great customer service, attention to detail and premium project locations. Phase 2 Alexandra Court Richmond condos are called Belgravia by Polygon and here, you can enjoy a beautiful enclave with pampering amenities, green spaces, and a great/central neighbourhood that is within walking distance to great neighbourhood services, lifestyle opportunities and much more. Alexandra Court Richmond Belgravia condos are located in the highly sought after Alexandra Gardens neighbourhood that has been transformed into a vibrant yet quiet residential community. The very best of what Richmond has to offer is within minutes of your front door. From great boutique stores to big box retailers and from cafes to restaurants and local services to recreational venues, the presale Richmond Belgravia Condos at Alexandra Court place you front and centre of the city. As well, there is a plethora of dining options along Alexandra Road and the latest fashion boutiques and shopping centres are also within a short walk or drive away. In terms of commuter transit routes, the Belgravia Richmond Alexandra Court Phase II condos are within walking distance to the Canada SkyTrain Line that gets you to other points in Richmond as well as to downtown Vancouver within 20 minutes. More information is online at www.polyhomes.com where you can also register your interest with a sales staff. The contemporary building is designed by award winning Robert Ciccozzi Architect and will feature urban brick facades, a large interior courtyard with beautifully landscaped grounds and a classic water feature at the entrance to the clubhouse which adds visual appeal to the entire community. The Phase 2 Alexandra Court Richmond Belgravia condos will also feature an impressive lobby with classically stained wood paneling and imported stone floors that are just stunning. As well, some of the West Coast architectural detailing at the Belgravia Richmond condos includes brick cladding, metal work, concrete monuments, trellises and distinctive brick landscaped walls. As well, the new Polygon Alexandra Gardens condo community will feature a large central courtyard (private for residents only) with lush landscaping, a reflecting pool, planted orchard fruit trees, a herb garden, comfortable outdoor seating areas, extensive lawn area and a zen garden. Home buyers at the presale Richmond Belgravia condos at Alexandra Court community will also have access to the exclusive Alexandra Club with over 12,000 square feet of amenities. The building will have a double height ceiling and expansive over height window panels that overlook the pool deck. The beautiful facility at Alexandra Club will also feature an inviting outdoor swimming pool, whirlpool area, beautiful deck, a table tennis room, gym/court, outdoor dining/entertainment areas with free standing gas BBQ and fully air conditioned interior spaces. The new Belgravia Richmond condo owners will also be able to make full use of the fully equipped fitness centre that comes with a mirrored yoga area, cardio machines and free weights. There are separate men’s and women’s change rooms as well as a screening room for movie nights. The Alexandra Court amenities also feature a billiards table, seating area and bar. For kids, there is an outdoor children’s play area in addition to an onsite resident concierge desk. There is also a hotel style guest suite on site at the new Richmond Belgravia condo amenities area. Some optional upgrades include extra parking stalls and storage lockers. The building itself at the presale Richmond Belgravia Condos at Alexandra Court Phase II condo release includes underground parking, visitor parking, the comprehensive warranty protection by Travelers Insurance Company of Canada, Polygon New Generation rain screen technology and an enterphone at the lobby entrance. 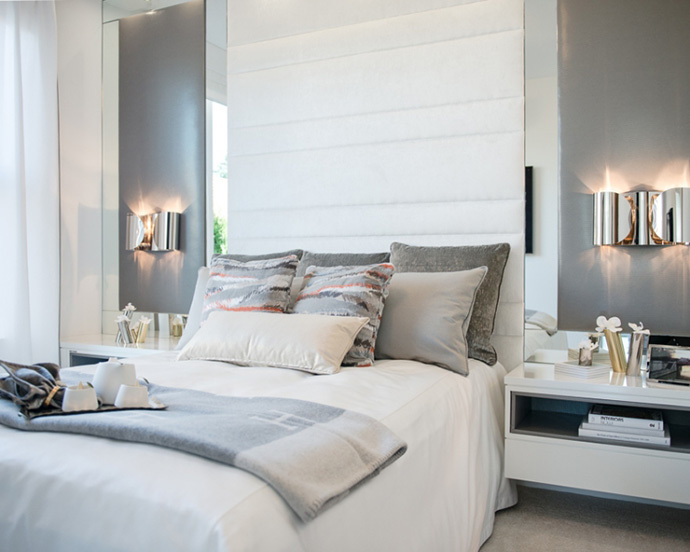 Beautiful interiors include rich wood style laminate floors throughout the main living areas, plush carpets in the bedrooms and your choice between 3 different designer colour schemes (White Pearl, Dark Pearl and Grey Oak). As well, the Belgravia Alexandra Court Phase 2 condos will feature nine foot high ceilings, stained wood flat panel front door, temperature controls in each room, air conditioning, generous outdoor living areas, three paneled interior doors, contemporary horizontal mini-blinds on windows and vertical blinds on sliding doors. All homes at the new Richmond Belgravia apartments come with full capacity stacked washer and dryer. The brilliant bathrooms will feature a private ensuite off the master bedroom with a modern deep soaker tub, or separate tub and shower with frameless glass door enclosure, rain shower head, engineered stone counters, dual porcelain under mount sink and polished chrome accessories. 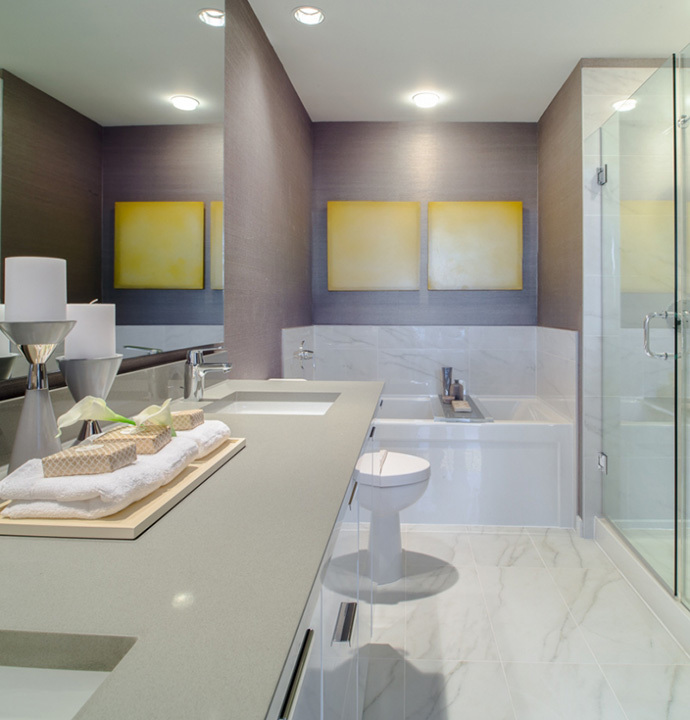 The ensuites will also feature contemporary floating vanity mirror and attractive flat panel cabinetry. There is also designer selected marble style tiled floors and high efficiency dual flush toilets. The impressive kitchens by Polygon at Alexandra Court Phase 2 Belgravia Richmond apartments include over height custom flat panel cabinets with sleek polished chrome pulls and under cabinetry lighting as well as a contemporary brand name appliance package that includes a 30” wide gas cooktop and electric self-cleaning wall oven by KitchenAid. There’s an integrated 24” wide dishwasher by KitchenAid and a 24” Blomberg fridge with integrated custom cabinetry. There’s also a variable dual speed slide out ventilation system. The kitchens at the presale Richmond Belgravia Alexandra Court by Polygon apartments will also feature engineered stone counters with convenient overhang for breakfasts and coffee breaks in some homes, full height glass tile backsplashes, sleek stainless steel undermount sink with pull out veggie spray and convenient cabinets with soft close hardware, stacking bank of drawers, lazy susan and adjustable shelve units. There’s track lighting and dual roll out recycling bin station too. As a VIP registrant for Polygon’s Alexandra Court, we wanted to update you on the latest news at this sophisticated apartment community in Richmond. We are excited to let you know that Phase I at Alexandra Court is sold out! Our second building, Belgravia at Alexandra Court, will be commencing sales very soon and exclusive previews are now being conducted! Construction continues to progress smoothly with completion of Belgravia Richmond condos projected for next year. Located in Richmond’s highly sought-after Alexandra Gardens neighbourhood, Alexandra Court is well-situated for an exciting urban lifestyle. Hundreds of fashionable boutiques and restaurants are within walking distance; there is even a village-style shopping area, Central at Garden City, being developed just down the street. At the heart of the community, an expansive courtyard and an impressive 12,000 square foot clubhouse offer a plethora of fun activities for the whole family to enjoy. 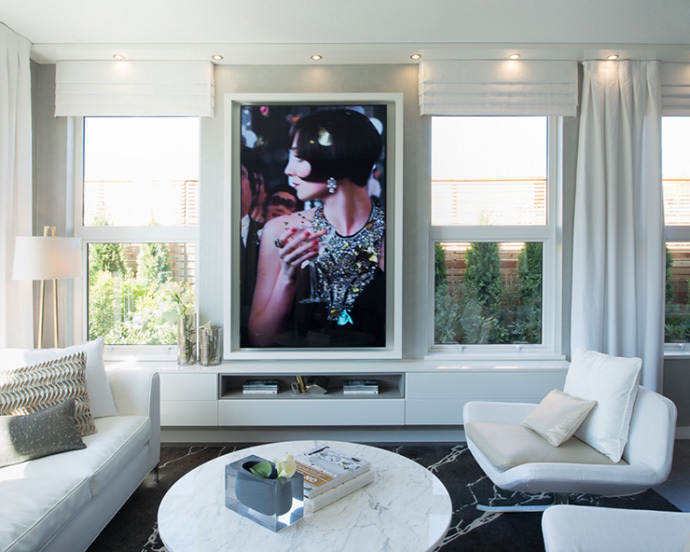 Inside, the elegant homes at Alexandra Court showcase a long list of thoughtful features such as over-height 9 foot ceilings, air conditioning, superbly outfitted gourmet kitchens and spa-inspired ensuites. If you are looking for a new home in Richmond, we encourage you to visit our sales centre at your earliest convenience so that we can provide you with the advanced information you will need prior to our upcoming sales opening. In the meantime, if you have any questions, please feel free to call or email us anytime. Alexandra Court Sales Centre is located at 400 May Drive Richmond and is open 12 – 6pm daily (except Friday).